Lately I’ve been fussing over my food photos. I’ve been so unhappy with them. It’s several different issues which I’m convinced is partly due to my camera. The colors are off. Photography in dark restaurants is an issue. And there’s only so much I can do in Photoshop. But recently I found a food blog that’s so refreshing because there’s no staging or post production work. It’s 100% real. 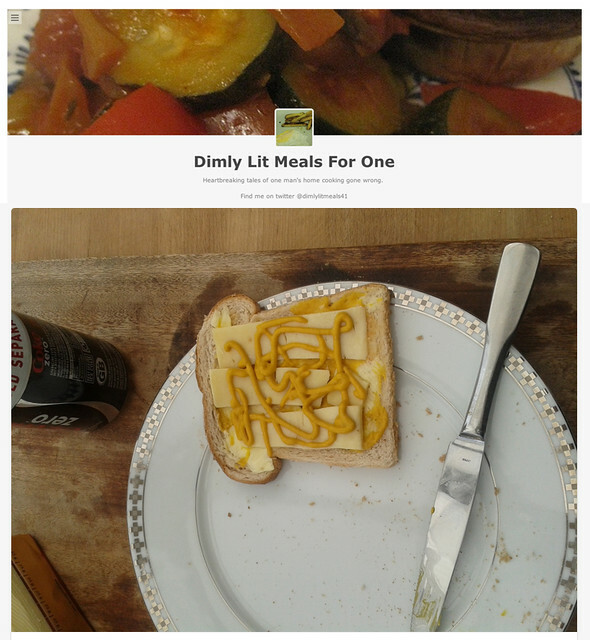 The website is hilariously titled Dimly Lit Meals for One: Heartbreaking tales of one man’s home cooking. Between the photography and humorous writing, it ignited something in me. 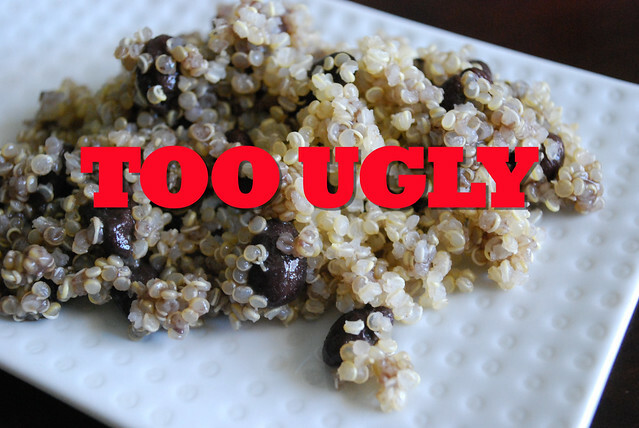 Are food blogs today the uberphotoshopped models of fashion magazines? Does my food look like that every day? More importantly… does yours? Don’t get me wrong. I love looking at beautiful food but it’s giving my everyday food an inferiority complex. Are my utensils clean? Is it properly lit? etc. etc. With the exception of what I order in restaurants and blog material, the definitive answer is a strong NO. The food I manage to eat during the day is oft-times eaten over the sink (something I touched upon in The Girl With the Donut Tattoo), a mishmash of leftovers from several days, and food on the brink of expiration that I had no choice but to use because I hate food waste. 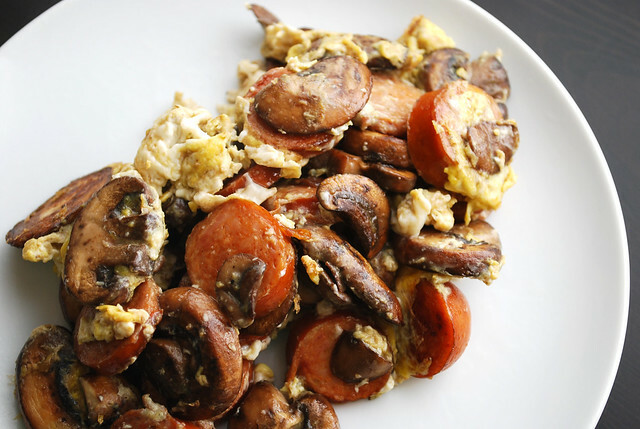 An example is the hot link sausage, sliced mushrooms and egg fried up in the same pan a few months ago. (Why I decided to take a photo of it is beyond me.) If I recall, the sausage and mushrooms were beginning to look a big gnarly, so what makes it better? Scrambling it with eggs OF COURSE. This — in essence — is my ideal food on the go: lots of protein. More recently aka last night, Paul looked at the kale soup I was making and decided to go the leftovers route. 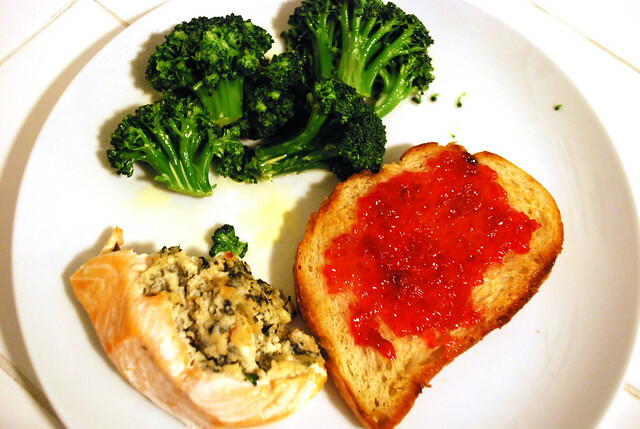 Leftovers from previous dinners included half of salmon stuffed with feta cheese and spinach, a slice of Bread & Cie sourdough with cherry jam (the jam was his choice), and steamed broccoli (upon my insistence). Balanced? Maybe. But Paul was satisfied since he didn’t have to eat kale. Guessing Game: Pizza or Flatbread? I would say 90% of the meals I make are completely unphotogenic. And also usually contain a few random broccoli florets so I feel like we’re at least trying to eat a balanced meal. Who has time to style weeknight dinners? 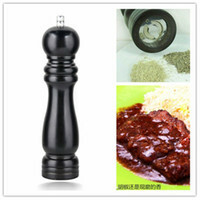 I think we touched upon this with one of your dishes using the Garlic Simmer Sauce from Trader Joe’s. Broccoli florets the go-to veggie that both Paul and I can agree on. He would prefer peas but I see no high nutritional value in them. That guy’s blog is hilarious! Refreshing and real though. I laughed when I read that you had an “inferiority” complex when looking at those fancy photos on some foodblogs. omg, i can’t even work my regular point and shoot! why mess with a DSLR? There’s a reason why I don’t really post my homemade lunches and/or dinners, ha ha. Totally unphotogenic! We will usually eat a mish mash of leftovers until it’s gone but no more than 3 or 4 days of doing so. I love leftover mish mash but four days is a long time! I love those photos from that guy’s blog! I can totally relate b/c I don’t have a nice camera or photoshop for my photos. What is the Photoshop version you use? Is it free? Haha! The photos are hilarious. Since Paul and I do a lot of print design work we own a legit copy of Photoshop. It’s expensive but a necessary evil unfortunately. I’m hoping that someone invents smell-a-blog to make up for lackluster photos. I’m gonna play devil’s advocate and brag about the aesthetics of my usual meals. I have to admit, they look pretty good. But that’s because I’m crazy and love organizing (even on the plate) and enjoy food when it looks good. I’ve seen your photos and they always looks so lovely. I think the only times I see paper napkins in a food photo is when it’s taken at a fast food chain. That blog is pretty hilarious — I love the down-on-his-luck tone and the submitted photos. Hilarious! Honestly, photography is the main reason I haven’t started a food blog. While I know the basics of composition and lighting, and have the Photoshop skills (or Pixlr.com skills since it works just as well for my professional purposes), I don’t have the time to stylize a shot nor do I have the big bucks to spring for a DSLR of my own. Having done it professionally, I do appreciate all the hard work that goes into food blogging from the writing and aesthetics to the technical know-how. It’s no mean feat to post regularly, especially with something as involved as recipe development. So, thanks for keeping things delicious-looking! It was definitely a different and refreshing food blog but I also like the perfectly stylized photos too. Combining great writing and photos takes a lot of time. Haha… precisely the reason why I don’t write about things I cook. It doesn’t ever look that pretty. Plus I’m usually hungry and don’t have the time to style the food. Even when I do photos of stuff I baked, I am kind of half-assing it anyway, usually taking photos in my backyard. I will totally not do a post if I don’t like the photos I took. I’ve seen your photos on Instagram you make at home and they look great! I agree that backyards are great settings for food photos. Perfect lighting and you just take the plate outside. Done! Thank you for that blog link! I would rather see ‘real’ than doctored photos-or food presented to me knowing it would be blogged about (and therefore ‘presented’ in a prettier way than most diners receive). Your meals are technically balanced…the photos look good…and maybe making kale chips (tear, toss with salt, pepper and olive oil, then bake in a single layer) would help Paul enjoy the goodness of kale…maybe. Thanks Cathy! I love kale chips but when I served it to Paul, he ate it begrudgingly saying it tasted like grass. Oh well, I tried! I try to keep my food styling (for the blog and in real life) pretty minimal. I used to swoon over vintage props and one-of-a-kind oddities, but that stuff just isn’t me. As a journalist, I come from the camp that food styling should be natural, meaning that the food should remain edible after the photo is taken. No non-edible crap to make the food look pretty. The key to good looking food photos is light and knowing how to use your camera’s custom white balance regardless of whether it’s a point and shoot or a DSLR. My latest post for the food blogging challenge is a good example. I used only the light coming in from a window. Food always looks best in natural light (when i use flash, i manipulate the flash to try to make it look like sunlight but sunlight is always my first go-to). All the process photos where shot with a point and shoot because I didn’t want to fuss with my 5D for them. The key was to use a custom white balance and NOT rely on the camera’s AWB setting. Most point and shoots allow you to set a custom balance. For the finished photos, I did use my Canon but again, I used a custom white balance and I shot the photos one stop over exposed because I was shooting on a white background and I wanted it to stay white. Shooting on auto, the camera would have tried to make the white a gray. The photos weren’t over worked in photoshop. As a matter of fact, all I did was adjust the levels so the histogram was evened out, bumped up he saturation by a mere 10% to compensate for the flattening of the shadows and sharpened (because I shot raw both the canon files and the point and shoot files which then requires sharpening before exporting to JPEG). IF the white balance is set correctly, there should be no need for extensive photoshopping. shooting inside restaurants is an entirely separate beast. I tend to shoot only when i get to restaurants early enough to sit by a window where I can use natural light. and if i do have to shoot later under artificial lighting, again, white balance will save a lot of the photos. to set a custom white balance, take a photo of something white (i carry a notebook with me so that tends to work well or use a white napkin). No need to focus just make sure the white object fills the entire frame and that the camera says it’s the correct exposure. then, go to our camera’s custom balance setting, navigate to the photo you just took and press OK when the camera asks if that is the photo you want it to use to set the white balance. now, when you shoot, change the white balance from AWB to custom and your camera will be adjusted to the current lighting conditions. all cameras are slightly different so follow your manual’s instructions for setting white balance. Cool! That’s really thorough… I hope you had a chance to visit Dimly Lit Foods for One. It’s an awesome site and the basis for my fun post. Thanks! i did! it wa funny! Hilarious post Darlene! I just checked out the website and loved it. P.S. My husband hates kale too.